A flying object becomes very exciting when no-one can identify it. But once alien hunters realise they’ve been fooled by a flying frisbee or mugged off by a model spaceship, the whole thing feels a bit silly. But not every alien sighting is unexplained, let alone genuine. Hoaxers have used everything from lawnmowers to rubber dummies in their bid to fool the public into believing aliens have visited our planet. Here are six of the most audacious hoaxes – and the reasons why some people were fooled by them. George Adamski claimed to have been visited by Nordic aliens, writing three books about his experiences. Later analysis showed the UFOs in his films and photographs were cobbled together using lightbulbs or other bits and bobs. Although Adamski was labelled a hoaxer, he continued to peddle strange stories throughout his life, claiming aliens lived on most planets in the solar system. Nonetheless, his images of cigar shaped motherships and strange craft flying in formation are among the most famous in UFO history. Strange patterns have appeared in fields for decades, but the most famous outbreak of crop circles happened in England during the 1980s and 90s. When two “jovial con-men in their sixties” stepped forward to claim responsibility in 1991, the cereal scam appeared to have been exposed. “They called us ‘superior intelligence’ and this was the biggest laugh of all,” said David Chorley, who claimed to have pulled off the stunt with his chum Doug Bower. Cereologists – people who believe crop circles were created by paranormal activity – gave the pair a frosty response, questioning how two elderly chaps could make the stunning patterns. Scientists might not think crop circles are created by aliens, but a thriving community of cereologists beg to differ, suggesting ET is sending messages by squashing down farmer’s prize plants. This is perhaps the most famous hoax of all and supposedly shows the autopsy of a grey alien who crashed to earth. 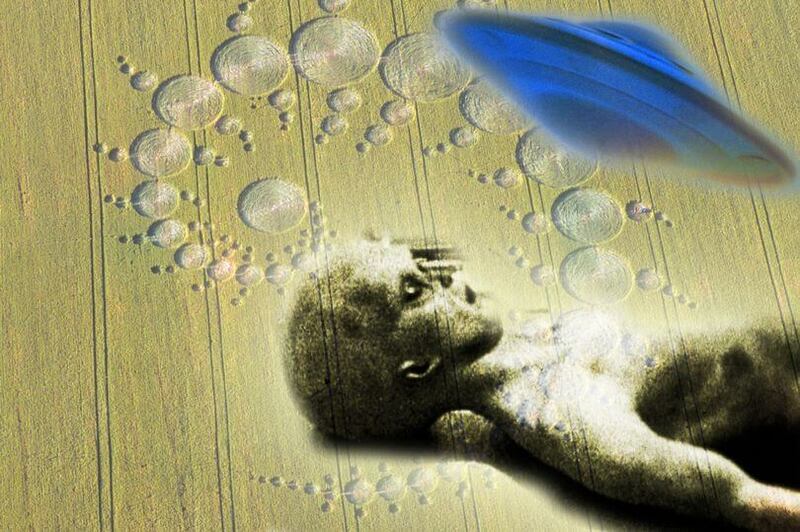 The film was released in 1990 by a London-based entrepreneur called Ray Santilli and was marketed as bona fide footage of an extraterrestial who crashed at Roswell. But it was later exposed as a hoax, after allegedly making its owner a tidy sum. The footage was broadcast in more than 30 countries and is one of the best-known attempts to fool the public with a faux-alien. We think of alien scams as a 20th century phenomenon, but this stunt happened way back in 1835 when an American paper called The Sun claimed to have observed life on the moon. A story was fabricated about illustrious astronomer Sir John Herschel spotting bat-like humanoids, unicorns, beavers and bison on the lunar surface. Sir John was initially amused by the scam, but later grew sick of being asked about the hoax throughout his life. Circulation of The Sun skyrocketed after the moon hoax – and it never issued a retraction. In October 1938, American radio listeners were sent into a panic when a CBS radio bulletin announced that Martians had launched an invasion. Of course, the fake news program was actually a dramatisation of H.G. Wells’ War of the Worlds, directed and narrated by Orson Welles, and wasn’t meant to be a hoax. But American public was already keyed up, used to hearing breaking news about Hitler’s annexation of German-speaking parts of Czechoslovakia. Many tuned in late without hearing an introduction which revealed the show to be a drama, making them believe aliens really were massing for an attack. Mass hysteria then ensued and although newspapers have been accused of talking up the extent of the panic, there is no doubt Welles put the willies up a huge number of Americans – before the rest of the world laughed at them. These incredible photos are still controversial, with some describing them as a “UFO-model-hanging-by-a-string” scam and others claiming they depict a genuine alien craft. Tyey were snapped in 1950 by farmer Evelyn Trent, who spotted a “slow-moving, metallic disk-shaped object heading in her direction from the northeast”. She shouted to her husband, who took a photograph which has been discussed ever since. The pair insisted the photographs were real until they died and initial examinations of the images suggested they had not been tampered with. Subsequent research claimed to have detected evidence of a thread of string in the snap, although no-one has yet fully answered the question of whether the McKinville UFO was real or fake.